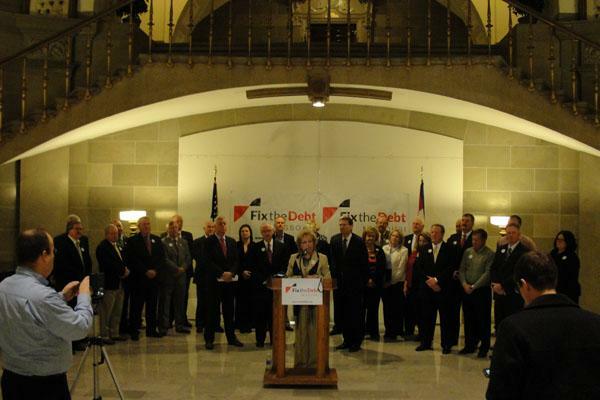 Officials gather at the Missouri Capitol for an event announcing the formation of "Fix the Debt Missouri." Updated 4:30 p.m. with copy from KBIA's Ryan Famuliner. A bipartisan group of Missouri leaders is trying to put pressure on Congress to address the national debt – and says tens of thousands of Missouri jobs are at stake. The group, “Fix the Debt Missouri,” joins a larger national group of political and business leaders urging bipartisanship in Washington – as the so-called “fiscal cliff” looms. Former Republican US Senator Kit Bond is one of the chairs of the Missouri chapter of the group, which announced its formation at the Missouri Capitol today. Bond, though, later said he wasn’t sure whether Congress could come to a bipartisan agreement to avoid the fiscal cliff - a group of tax increases and budget cuts that will go into effect at the end of the year if Congress doesn’t act. Bond was joined by his other co-chairs at an event announcing the formation of the group. They’re former Democratic Governor Bob Holden, Democratic State Treasurer Clint Zweifel and Republican Lt. Governor Peter Kinder. All the speakers urged movement to address the fiscal cliff. Zweifel said his office estimates Missouri would lose 40,000 jobs if Congress does not act. The speakers also said the conversation shouldn’t stop at the fiscal cliff – Congress also has to work together on issues like spending caps, debt servicing, and finding ways for the United States to compete in the global economy.